Throughout the history of astronomy, human beings have deepened our understanding of the universe by elucidating the true nature of mysterious astronomical objects. When I was a graduate student in the 1990s, the most mysterious astronomical object at the time was a gamma-ray burst (GRB). GRBs are sudden flashes of gamma rays that last for about 10 seconds. Although GRBs were discovered around 1970, their distance would be completely unknown for another 20 years, which meant that we did not know whether this phenomenon occurred in our solar system or at cosmological distances. In 1997, the X-ray and optical afterglow of a GRB was detected and revealed that they are extreme explosions that are much more energetic than a supernova and are located at cosmological distances. Our knowledge advanced in the following decade and we learned that GRBs were caused by a special type of supernova that occurs when a massive star explodes. In hindsight, my statement was rather arrogant as shortly after, a new mysterious object called “fast radio burst (FRB)” was discovered in 2013. FRBs are bright radio waves that last for a shorter duration than GRBs, flashing for just a few milliseconds. FRBs are still quite enigmatic as their distance from the Earth has yet to be accurately measured, a predicament similar to that of GRBs up until the 1990s. However, it is possible to estimate the distance of FRBs by referring to their low frequency radio waves, which are delayed when passing through plasma. Using this method, we have estimated that FRBs are far beyond our galaxy at cosmological distances of five to ten billion light years away. The origin of FRBs are still unknown and several theories have been proposed, including supernovae and neutron stars. I for one have theorized that FRBs come from binary neutron star mergers. Astronomers all over the world are now in fierce competition to reveal the true nature of these mysterious objects. Our research group has also observed one FRB by using the Subaru Telescope and found that its host galaxy appears to be five billion light years away. This is debatable, however, as there is also a claim that this may be an active galaxy that is unrelated to fast radio bursts. Another FRB was also detected afterwards at 2 billion light years away. This FRB might be somewhat special as, unlike others, it bursts repeatedly, indicating that it may in fact be a completely different type of FRB. I can’t wait to see how much more we will learn about this enigmatic astronomical object in the next decade. Moreover, I hope that some undergraduate students reading this article will choose to pursue graduate studies in this research area and tackle this mystery. By then, FRBs may perhaps not be as mysterious as they are now; however, there is no need to worry. As history has shown us, with advances in observational technology will undoubtedly come the discovery of yet another mysterious astronomical object. Figure 1: Observational results of the FRB captured by the Subaru Telescope in April 2015. 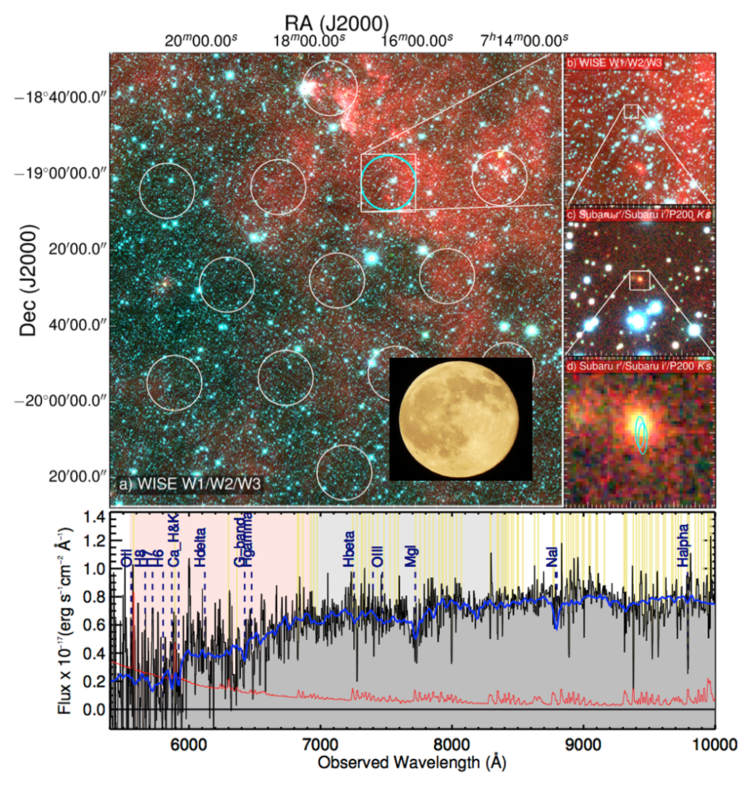 The white circles in the upper left panel indicate the search areas for radio astronomical objects and the cyan circle denotes where the FRB occurred. The size of the full moon is also shown for reference. The upper right three panels show a candidate host galaxy. The spectrum at the bottom provides evidence to suggest that this is an old elliptical galaxy located about 5 billion light years away.